I have this chainsaw and for the money is great for the simple garden jobs and camping when you don't want to disturb the neighbours. As an owner of both the Brushed & Brushless Ozito PXC Chainsaws I can absolutely recommend not going for the $119 Brushed model and get the $199 Brushless instead. Absolutely miles ahead of the cheaper one and well worth the extra $80. 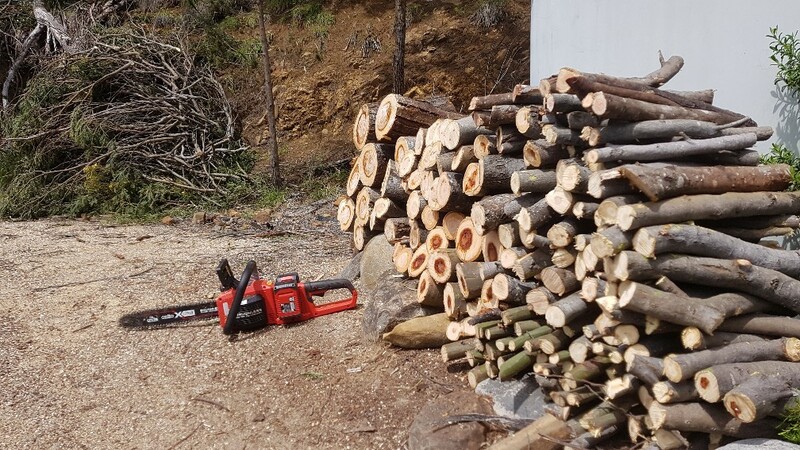 Absolutely rock solid and I now much prefer using it to my $1500 Husqvarna beast for most jobs… but of course the Ozito wont do the BIG jobs like the Husky. No worries. Here is the brushless model but note it's a skin only so you'll need batteries. Great for those who already have the Ozito PXC ecosystem but not so good for those who don't. BTW, here's a pic I took of what I managed to do with the brushless model on a single charge of 2x 4Ah batteries. There's a few large-ish logs just out of shot on the other side of the pile too, each at least 12-14" diameter. This is Wattle from Tassies East Coast which is known for being painful to cut and has always been a hassle with the big Husqvarna but this little Ozito was a breeze to use and I didn't even sharpen the chain! Can't recommend it more. I am looking to remove many branches from a palm tree which has never been maintained. Would something like this be best or perhaps just a cordless circular saw or small reciprocal saw (which I have already)? Mind you the reach is the main thing. Thanks! Fortunately tree isn’t too high right now but I see your point. I will investigate the cordless pole pruner option. I have a manual one but don’t like the thought of cutting through palm branches with it! Depending on the palm tree height you may need a pole saw. Preferable to not be working to close to the tree so you can see what you're doing. Take good care as you don't want to be speared by a palm spike. Like Yuccas these are evil bastards with very few redeeming features. If you aren't working above shoulder height then small chainsaw or handsaw is fine. Don't use a circular saw or the like, and don't put the fronds in a chipper. Thank you. I will follow your advice too. Gotta cut the meat up somehow. I have a similar mini-chainsaw, and it is great for camping, when you want to collect a few small logs for the campfire. These are also good for pruning branches from trees, as they can be operated safely one handed. Slow, of course. Thanks OP, had this exact chainsaw in my eBay cart for the last few months. Will be excellent for campfires as it gets colder. I have the 80V Stihl 160, it's comparatively gutless, good for twigs and rest of the world softwoods I guess. I also have an 18V Makita LXT reciprocating saw that gets used in the garden and it;s gutless as well, I can only imagine what an 18V saw cuts like ? My 18V Reciprocating saw probably. I do use the Stihl a lot … but lots of patience and a super sharp chain is needed.